Kvemo Kartli is historically on the furthest frontiers of Georgia. That's why it was first used as a point of attack for numerous invaders. The historical monuments here are plentiful, for example, Bolnisi bishopric is one of the oldest in Georgia. 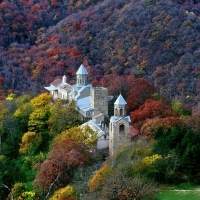 Bolnisi Sioni was built in the 5th century during Vakhtang Gorgasali's reign. Bishop David and the cathedral construction date, 478-493 are both mentioned in the inscription on the walls. The ruins of the town of Dmanisi are world famous. In 1990, during archaeological excavations, Scientists discovered the oldest remains of a Eurasian man, dated 1,700,000 years old. 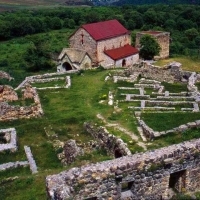 The archaeologists have dug only a small portion, where dwellings were discovered, there are narrow streets, a citadel with a fortified stone fence, Dmanisi Sioni basilica of the 9th century, and some small churches and other buildings. Bethany monastery, founded in the 12th -13th centuries during the epoch of Queen Tamar, is located in the valley of the river Vere. There are masterfully painted frescos on the walls and on one of them Queen Tamar is represented. One can get to the Monastery through the scenic Tbilisi-Kojori motorway. There are trails here for those fond of horseback tours. Ancient basilica of Bolnisi Sioni is located in a picturesque village of Kvemo-Bolnisi,The temple is the oldest preserved architectural monuments on the territory of the country. The construction dates back to 478-493 A.D., during the rule of legendary King Vakhtang Gorgasali. 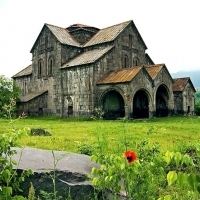 This epoch is important for Georgia, as at these times the state and unique national culture were formed; Georgian church became independent from Constantinople, the capital city of the Byzantine Empire. It is hard to overestimate significance of the church and its influence on Georgian culture. In addition to the fact that the building is the oldest in the country and still functions, the façade of Bolnisi has inscriptions representing the first samples of Georgian writing. The cross embossed on the eastern façade of he church, later called Bolnis cross, became one of the symbols of the state; it is depicted on the modern flag of Georgia. 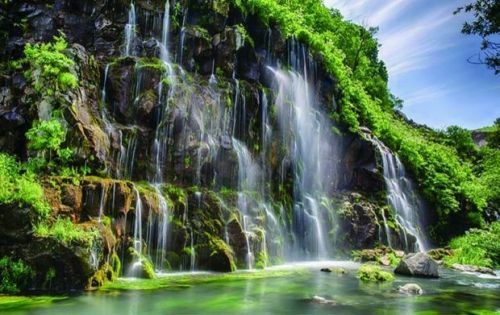 Dashbash Canyon Natural Monument is a canyon carved by Ktsia (Khrami) River in the stream bed cut through the volcanogenic rocks of Dashbash volcanic plateau, distinguished by its rarity and biodiversity. It is located at 1,110-1,448 m above sea level. The vegetation cover of the surrounding ecosystem is rather sparse, whereas the plants on the steep slopes of the canyon and astounding waterfalls create absolutely different micro-landscape, with characteristic micro-climate, specific fauna etc.